The best way to keep pests out is prevention. I know, I know, you already have pests. But preventative measures can help keep the problem from escalating, and actually help get rid of existing pests. The best way to keep unwanted bugs and rodents away is to keep your house extra clean and in good repair. Pests tend to be attracted to the unsightly elements of a house, like unsealed or old garbage, leaky pipes, and food residue. They can also enter your home through cracks, rotted wood, and be attracted by overgrown plants and piles of firewood or debris nearby. Keeping things tidy will help keep pests out in the first place, and a good clean up can help make your home less than hospitable to current invaders. If your pesky problem is ants, then try a vinegar and water spray. Mix roughly one part water and one part vinegar in a spray bottle. Track down the ants to find their trail and see where they are entering the house. Spray at their entrance and along the baseboards, door, and/or windows. Follow the trail and spray its entirety. This will kill the ants sprayed, and more importantly, it will ruin their scent trail. Keep an eye out for more ants, and spray wherever you see one hanging out. Let sit before wiping up dead ants with a cloth, and repeat when you see more ants. Even if they don’t come back right away, repeat a few times the first week to keep them at bay. Vinegar spray isn’t enough to get the job done? 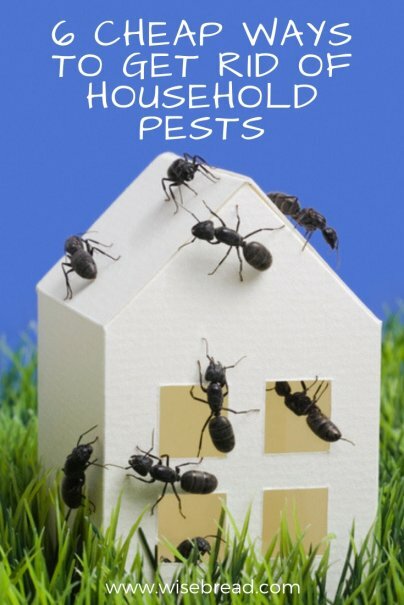 Create a homemade ant bait to rid your house of the pests. Rather than buying costly traps, make a Borax and sugar mixture and put in small containers. Place them in the ants’ path and let them feast. These ants will take the mixture back to the colony to share, killing more ants. This process could take a few days, as more ants come to grab the mixture and take it back to their hiding place. Depending on the time of year and the type of ant, they may be more into fatty foods, so something like peanut butter would make a better bait. If the sugar fix isn’t working, try mixing Borax with something oily or fatty. If you’re not into organic gardening, you might be scratching your head. Diatomaceous earth is a powdered substance made up of fossilized remains of phytoplankton. It’s non-toxic, harmless to mammals, and lethal to bugs. Some farmers feed it to their animals to help ward off pests, and some people include it in their diet for various potential health benefits. To get rid of pests in your home, sprinkle food-grade (not the kind for swimming pools) diatomaceous earth along baseboards and in corners — anywhere you typically find bugs. Use enough to get a good dusting, but do not pile up the powder, or bugs will just crawl over it. It may take a few days to work, but it will eventually kill the bugs in your home, and keep future bugs at bay. Diatomaceous earth can be effective at killing ants, spiders, and even bed bugs. It seems too simple, but if you’ve got tiny little gnats flying around your house, your plants could be the problem. Fungus gnats are attracted to moist soil, and will happily have babies in your potted plants. An easy way to get rid of these tiny insects is to let your plants completely dry out on the surface before watering. This will kill the larva and prevent new gnats from reaching maturity. Make sure your plants have good drainage, and clean up any standing water. Not only will these techniques solve your gnat problem, they are also good for your plants. Fruit flies and cockroaches can be a real annoyance, and while setting traps won’t completely rid your home of an infestation, they can help catch stragglers and keep your living areas bug-free. To create a homemade bug trap, cut off the top section of a plastic soda bottle. Invert it, and tape or staple it to the bottle opening, making a funnel into the bottle. To catch fruit flies or gnats, pour apple cider vinegar in the bottle. If you don’t have a huge population of the little flies in your house, using this trap for a few days can take care of the problem. For cockroaches, fill the bottom of the bottle with soapy water. Cockroaches are attracted to water, and will crawl in and drown. If a wasp made it’s way in your house, or they are ruining your picnic, pour some honey or other sweet into the trap to attract them. How do you ward off pests … naturally? i have a nightlight in the kitchen near the sink and plants. I put an ice cream container with water and a dab of dishwashing liquid. the knats fly to the light and die in the soapy water. Have to change it sometimes daily, gets moths and flys too.